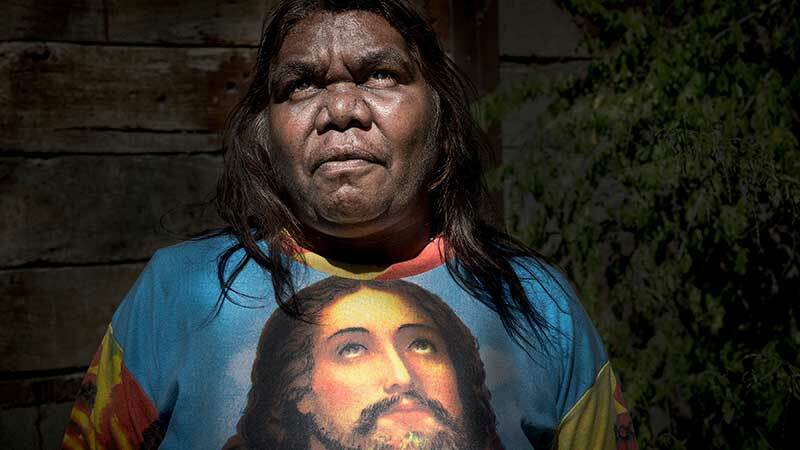 A portrait of Docker River Lutheran Beryl Bell entitled ‘Beryl and Jesus’ has won this year’s $10,000 Australian Life photography prize. Amy Jean Harding took the photo of Beryl at Big Sing in the Desert in April 2016. In her artist statement, Harding said: ‘Beryl has been able to entwine the ancient Dreamtime with her devotion to Christianity. Here is a woman with the ability to walk in both worlds’. Both women have been attending these community choir workshops since 2012, but they could hardly have travelled from more different locations: an isolated Indigenous desert community and the north coast of NSW. But that’s exactly what Big Sing is all about: bringing people together from diverse locations and cultures through song. Each year both travel huge distances to attend the event at Ross River, just 80km East of Alice Springs. Amy comes to takes photos and sing, ‘It’s such an incredible event and very moving’. Beryl comes to sing Christian hymns in her own language, ‘Big Sing makes me feel happy because we can sing and dance with people from other parts of Australia’. Amy Jean has shared her $10,000 prize money with Beryl and Big Sing: ‘I want to be able to give back to the Indigenous community and this wonderful annual event’.